I'm sharing one of my favorite recipes today. Honestly, it's not really a recipe at all. It's more like an easy, cheater recipe for a fun dinner. 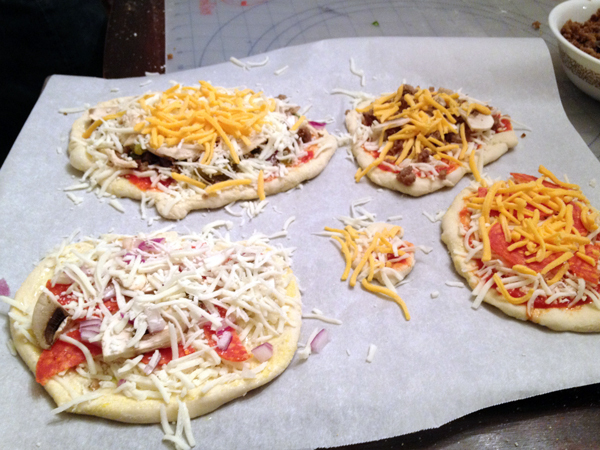 Growing up we used to have pizza night where we got to make our own mini pizzas with whatever topping we wanted. The secret to fast mini pizzas was a can of biscuits. Yes, biscuits, the kind that come in a tube and you pop it open and put them on a cookie sheet to bake for breakfast. My mom would roll out each biscuit and then we'd top it with sauce, cheese, pepperoni ... you get the idea. Anyway, we do the same thing now that I'm a mom, the only difference is the crust. There happens to be an awesome little hole-in-the-wall pizza place near me so I stop in and buy their raw dough. They sell the equivalent of a large pizza dough for only $3! Sure, it's more expensive than a can of biscuits but the taste of real pizza crust is tough to beat. What is this magical pizza place I speak of? The Pie Hole. I've mentioned it before when I made pizza balls. They have this white pizza that's really good and their cheesy bread, well, it's pretty much amazing. So go try it and take home a ball of dough. 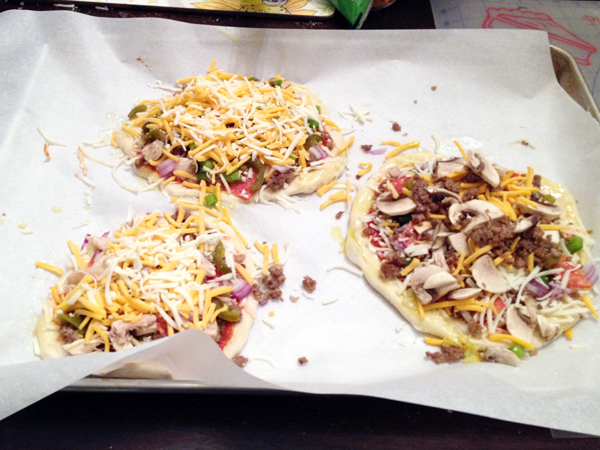 Since this really isn't a recipe, I'll just share what we had for toppings but really, the possibilities are endless. 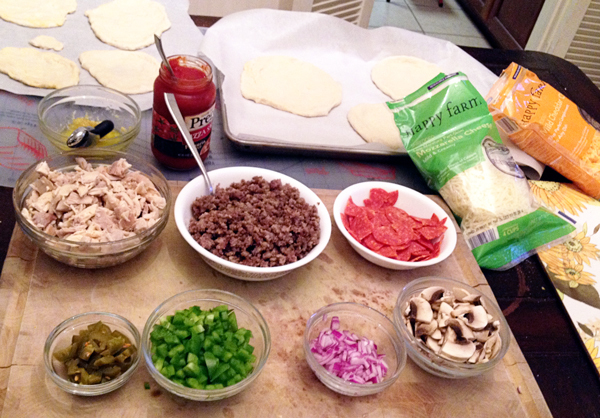 I set each topping out in little bowls: chopped onions, bell peppers, mushrooms, jalapenos, leftover cooked chicken, pepperoni and cooked sausage. We also had mozzarella and cheddar cheese and regular pizza sauce. Here's a tasty little idea for a different taste - make your own garlic butter glaze. In a small bowl combine 2 tablespoons of butter, 2 tablespoons of olive oil and two minced garlic cloves. Microwave it until the butter melts and brush that over the dough. 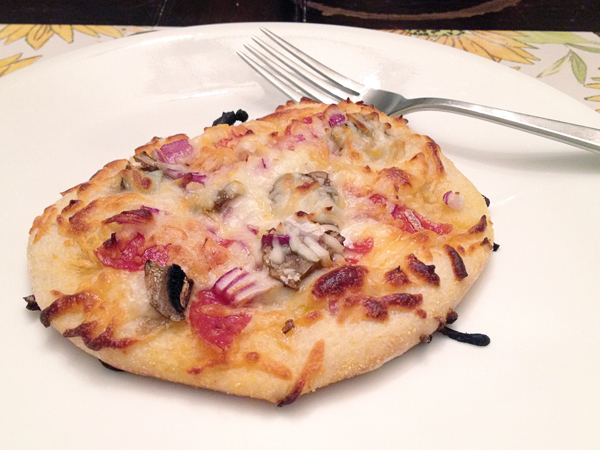 I made one with just the glaze and it was amazing but it's also really good with pizza sauce on top too. 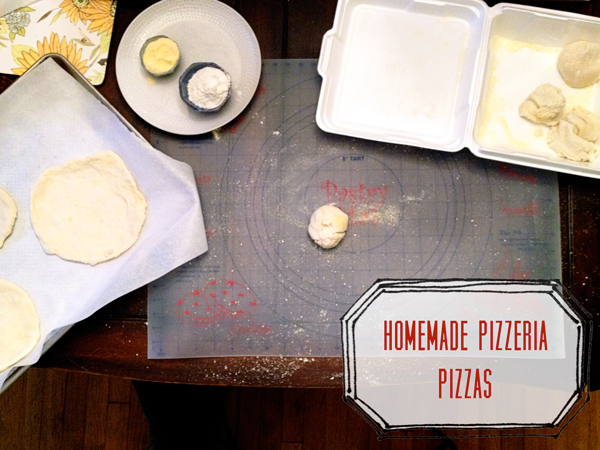 Anyway, I divided the dough into 7 balls, rolled each one out and then we each topped our own pizzas with the different toppings. It was fun and easy. Even Sweet P helped! 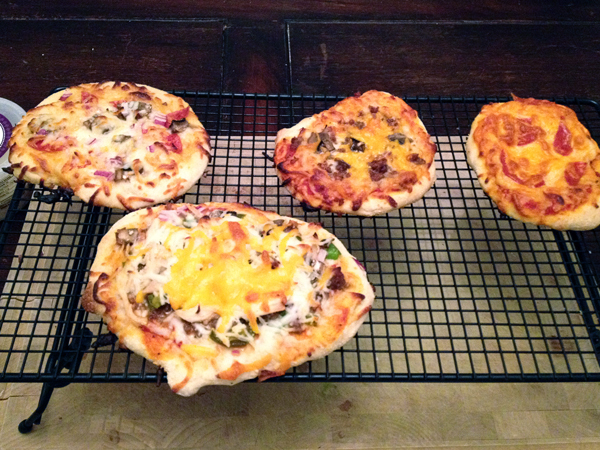 That's my pizza in the lower left with the garlic butter glaze, onion, mushroom, pepperoni and mozzarella cheese. It also ended up being my favorite. As for cooking them, here's another little tip I learned from making these in the past. Bake the pizza at 450 degrees on a cookie sheet until the cheese starts to brown. Then, take the pizza of the cookie sheet and put them back in the oven, directly on the rack and bake for a few more minutes. This will make the crust a little crunchy but still soft in the middle. And here's one of the husband's. So that's that. 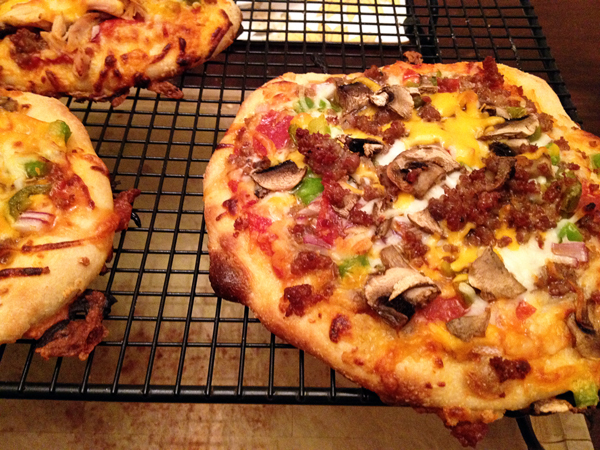 Homemade pizzeria pizzas. As good as, if not better than going out and much less expensive! 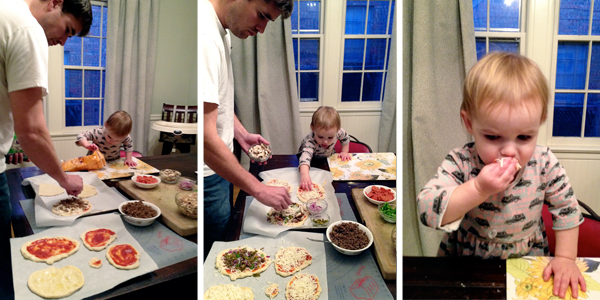 Our kids love having make your own pizza night! I like the idea of buying the dough. Makes for an easy meal. Oh yes! I remember the older post now. I need to get to this place and buy some dough. Thanks for sharing. This is genius. Pizza is one of my love languages...ha! I usually get our dough from Trader Joe's & it is good, but not "pizza place" good. I am going to call around to some of my favorite pizza places in town to see if they will sell me a ball of dough!